Many different type of coast artillery gun have been emplaced in Singapore, from smooth bore muzzle loading cannon up to the massive 15 Inch BL Guns. From the first gun battery at Scandal Point to the last operational one, Fort Siloso, guns were put into service at many locations. Information about these guns will be gradually added to the site. The mixture of names of guns, such as; 7 Inch, 9·2 Inch, 25 Pounder, 64 Pounder, ML, RML, QF & BL, can cause some confusion and requires explanation. In the early days of artillery, guns were classified by the weight of the solid shot (cannon balls) they fired. This identified the gun’s calibre fairly accurately as the size of a cast-iron cannon ball of a given weight did not vary very much. Cannon were themselves built in different sizes and weights, but may used the same size of shot, 6 Pounder for example. Some had longer barrels and used a greater propellant charge and became known as ‘Long 6 Pounders’. The size of the cannon was immaterial, 6 pounders fired the same weight of shot. As the size of cannon increased, so did the weight of shot. There were 32 pounders, 64 pounders etc. Other weapons such as mortars and howitzers firing shells rather than solid shot were introduced, and muzzle sizes grew. It soon became common for these weapons to be known by their muzzle size, such as 13 Inch Mortar. There were now two methods of identifying guns and in Britain, this was the case until after the Second World War. The move to using the muzzle’s diameter may well have been influenced by the weight of shot of the larger weapons as well. A 15 Inch naval shell would weigh 1,920Lbs (872Kg), meaning that 1,920 pounder would be a bit long winded as the name for a gun. ML means ‘Muzzle Loading’. The barrel of this type on weapon was smooth. The gunpowder charge was inserted into the barrel and rammed down to the breech end (rear of the gun), The cannon ball or shell was then inserted and rammed down to the charge. A vent pick was pushed down the touch-hole or vent to pierce any bagged charge. A priming charge of gunpowder was poured into the hole and the gun was ready to aim and fire by means of a slow match or fuse. Later guns used a friction cap or percussion cap instead of a priming charge. RML means ‘Rifled Muzzle Loading’. These guns were still loaded as above, but they had a series of grooves cut into the barrel from the muzzle down to the breech end. The shell in early days, had several metal studs protruding slightly from the base end. These engaged in the grooves and when the gun was fired, made the shell spin in flight. This stabilised the shell in flight and improve accuracy. The studs were later replaced by copper ‘Driving Bands’ (right) which are more efficient. QF stands for ‘Quick Firing’. A QF gun had the shell and propellant charge in a brass case all as one unit. The ‘Round’ of ammunition was inserted in the breech end, the breech closed and the gun fired. This enabled a very rapid rate of fire to be achieved by the gunners. 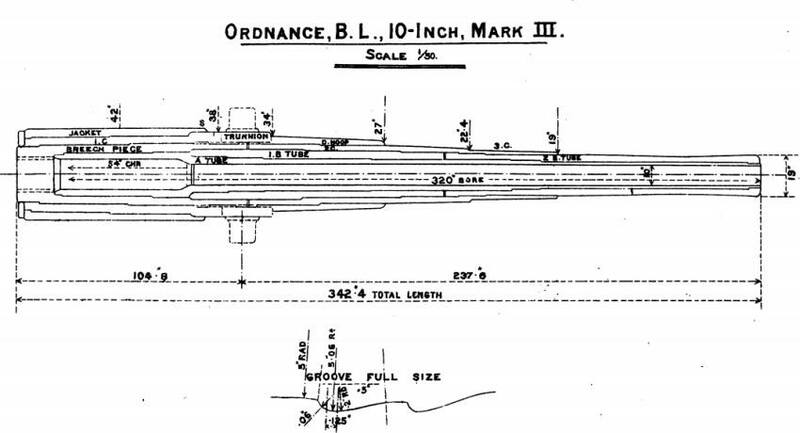 For large guns, such as 6 Inch, Separate QF ammunition was used. the propellant and primer being separate from the shell, encased in a brass case. BL stands for ‘Breech Loading’ As with QF, the gun is loaded at the breech end. The shell is inserted first, followed by a bagged propellant charge from which a tape is pulled to expose the propellant’s primer. A ‘Firing Tube’ is inserted in to the Breech Block to fire the gun. Shot, except case shot have white tips. Common and Palliser shell have black tips. Segment and ring shell have blue tips. Shrapnel shell have red tips. 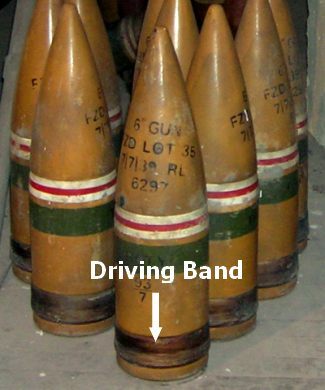 Steel projectiles have one white band. Armour-piercing projectiles have two white bands. Practice projectiles have one yellow band. Filled Shell have one red band. Lyddite shell are painted yellow.